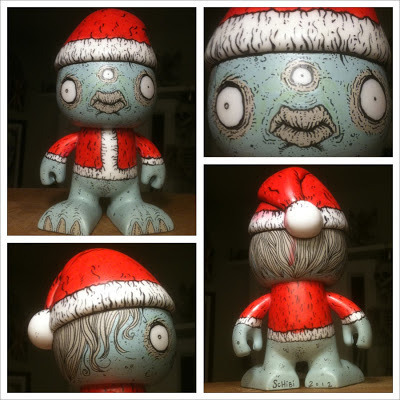 Drawing A Blank: The Art of Cody Schibi: "Holidaze Monster"
I'm currently practicing my vinyl toy painting skills for an upcoming show next year that I'm extremely excited about. It has some big wigs, so to be asked to join it was humbling & made me aware that I don't know crap-ola about customizing blank figures! This festive guy here is my VERY FIRST attempt at this thing the kids call "customization". I'll be putting all my "TESTS" in my store as I paint them, so please continue to check back.